We all know that going to the dentist can be a pain, sometimes quite literally, but your teeth are pretty precious – just think about how much you use them every day! Occasional bleeding gums are typically nothing to worry about, but continual bleeding could point towards a more serious issue. Bleeding gums are often caused by brushing or flossing too aggressively; it’s not a major concern unless you’re experiencing ongoing sensitivity. When plaque is not removed it can infect our gums, leading to swelling and soreness. Advanced gum diseases like periodontitis and gingivitis are a lot more common than people think – so if you’re apprehensive to bring this up with your dentist, know you’re not alone. Random spells of bad breath are nothing to be panicked by, this kind of thing is common and usually comes about from food residue and tobacco products. However, if the odour is chronic, it could mean something a lot more serious. Bad breath can be the result of a cavity, gum disease or infection. If you’re feeling concerned or self-conscious about your breath, see your dentist for an exact diagnosis (and peace of mind). As most of us know, toothaches can range from tolerable to excruciating. Any kind of constant pain is an indicator that you should see a dentist ASAP. 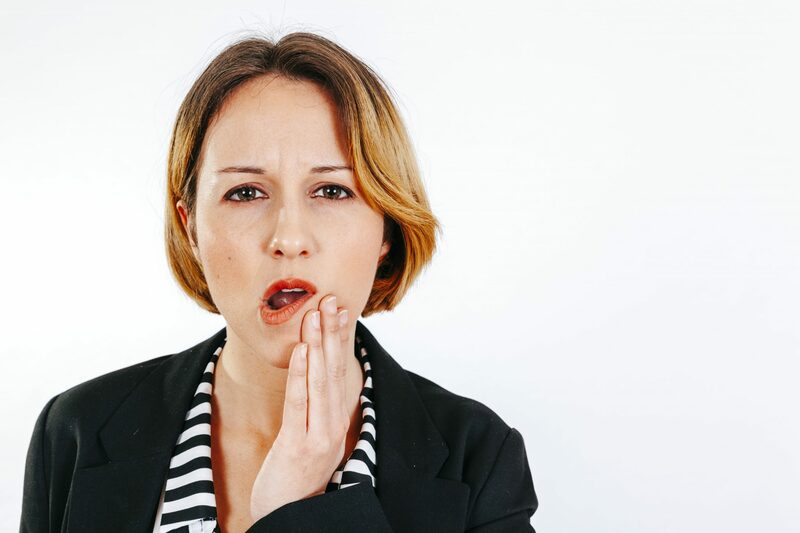 Toothaches can occur as a result of infections, cavities, gum disease, teeth grinding or an abnormal bite – and unfortunately, they are unlikely to heal naturally on their own. Don’t wait until the pain is unbearable to seek out professional help! While we normally don’t associate jaw pain with our teeth, it is actually a common dental problem. Jaw pain is frequently brought on by teeth grinding, something most of us do without realising in our sleep. Paul Beath Dental can evaluate your bite and help prevent teeth grinding with a customised mouth guard. Other causes for jaw pain can be a result of bacteria from a cavity reaching the root of a tooth which causes severe pain to spread in the jaw. Toothaches and sinus problems can also cause mild to severe jaw pain. If this sounds like something you’re experiencing, see your dentist for a professional opinion. Whether it’s red wine, smoking, or tea and coffee consumption – if the little brown marks don’t disappear after a brush or two, it’s usually time to lock in a professional clean! With regular dental check-ups and cleans, you’ll avoid paying more in the long run. They can help prevent major problems from developing and treat existing symptoms before they become more advanced. Give Paul Beath dental a call today on 02 4961 6300 or make an appointment online here.